For other uses, see Oregano (disambiguation). Oregano (US /ɔːˈrɛɡənoʊ/ or /əˈrɛɡənoʊ/; UK /ˌɒrɪˈɡɑːnoʊ/;, scientific name Origanum vulgare, is a flowering plant in the mint family (Lamiaceae). It is native to temperate western and southwestern Eurasia and the Mediterranean region. Oregano is a perennial herb, growing from 20–80 cm (7.9–31.5 in) tall, with opposite leaves 1–4 cm (0.39–1.57 in) long. The flowers are purple, 3–4 mm (0.12–0.16 in) long, produced in erect spikes. It is sometimes called wild marjoram, and its close relative O. majorana is known as sweet marjoram. Oregano is the anglicised form of the Italian word origano, or possibly of the medieval Latin organum; this latter is used in at least one Old English work. Both were drawn from the Classical Latin term origanum, which probably referred specifically to sweet marjoram, and was itself a derivation from the Greek ὀρίγανον (origanon), which simply referred to "an acrid herb". The etymology of the Greek term is often given as oros ὄρος "mountain" + ganos γάνος "brightness". Oregano is related to the herb marjoram, sometimes being referred to as wild marjoram. 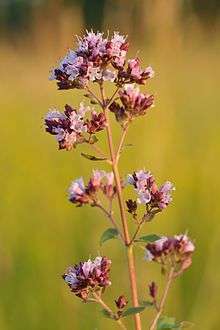 Oregano has purple flowers and spade-shaped, olive-green leaves. It is a perennial, although it is grown as an annual in colder climates, as it often does not survive the winter. Oregano is planted in early spring, the plants being spaced 30 cm (12 in) apart in fairly dry soil, with full sun. Oregano will grow in a pH range between 6.0 (mildly acidic) and 9.0 (strongly alkaline), with a preferred range between 6.0 and 8.0. It prefers a hot, relatively dry climate, but does well in other environments. Many subspecies and strains of oregano have been developed by humans over centuries for their unique flavours or other characteristics. Tastes range from spicy or astringent to more complicated and sweet. Simple oregano sold in garden stores as Origanum vulgare may have a bland taste and larger, less-dense leaves, and is not considered the best for culinary use, with a taste less remarkable and pungent. It can pollinate other more sophisticated strains, but the offspring are rarely better in quality. The related species, Origanum onites (Greece, Turkey) and O. syriacum (West Asia), have similar flavours. A closely related plant is marjoram from Turkey, which differs significantly in taste though, because phenolic compounds are missing from its essential oil. Some varieties show a flavour intermediate between oregano and marjoram. O. v. subsp. gracile (K.Koch) Ietsw. (= O. tyttanthum) has glossy green leaves and pink flowers. It grows well in pots or containers, and is more often grown for added ornamental value than other oregano. The flavor is pungent and spicy. - Central Asia, Iran, India, Turkey, Afghanistan, Pakistan. 'Aureum' – Golden foliage (greener if grown in shade), mild taste: It has gained the Royal Horticultural Society's Award of Garden Merit. Cultivars traded as Italian, Sicilian, etc. 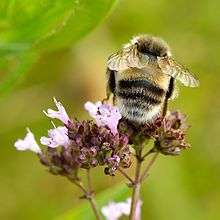 are usually hardy sweet marjoram (O. ×majoricum), a hybrid between the southern Adriatic O. v. hirtum and sweet marjoram (O. majorana). They have a reputation for sweet and spicy tones, with little bitterness, and are prized for their flavor and compatibility with various recipes and sauces. Oregano is an important culinary herb, used for the flavour of its leaves, which can be more flavourful when dried than fresh. It has an aromatic, warm, and slightly bitter taste, which can vary in intensity. Good-quality oregano may be strong enough almost to numb the tongue, but cultivars adapted to colder climates often have a lesser flavor. Factors such as climate, season, and soil composition may affect the aromatic oils present, and this effect may be greater than the differences between the various species of plants. Among the chemical compounds contributing to the flavour are carvacrol, thymol, limonene, pinene, ocimene, and caryophyllene. Oregano's most prominent modern use is as the staple herb of Italian-American cuisine. Its popularity in the U.S. began when soldiers returning from World War II brought back with them a taste for the "pizza herb", which had probably been eaten in southern Italy for centuries. There, it is most frequently used with roasted, fried, or grilled vegetables, meat, and fish. Oregano combines well with spicy foods popular in southern Italy. It is less commonly used in the north of the country, as marjoram generally is preferred. In Turkish cuisine, oregano is mostly used for flavoring meat, especially for mutton and lamb. In barbecue and kebab restaurants, it can be usually found as a condiment, together with paprika, salt, and pepper. The dried and ground leaves are most often used in Greece to add flavor to Greek salad, and is usually added to the lemon-olive oil sauce that accompanies fish or meat grills and casseroles. Oregano is used in the southern Philippines to eliminate the odor of carabao or water buffalo when boiling it, while simultaneously imparting flavor. Oregano oil and oregano have been used in folk medicine since ancient times. Although oregano or its oil may be used as a dietary supplement, there is no clinical evidence to indicate either has any effect on human health. In 2005, the US Federal Trade Commission brought legal action against a firm that had claimed oregano oil treated colds and flu or relieved bacterial and viral infections. In 2014, the US Food and Drug Administration warned a Utah company, Young Living, that its herbal products, including oregano essential oil, were being promoted to have numerous anti-disease effects and so were being sold as unauthorized misbranded drugs subject to seizure and federal penalties. Oregano contains polyphenols, including numerous flavones. 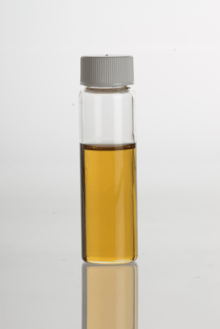 The essential oil of oregano is composed primarily of monoterpenoids and monoterpenes, with the relative concentration of each compound varying widely across geographic origin and other factors. Over 60 different compounds have been identified, with the primary ones being carvacrol and thymol ranging to over 80%, while lesser abundant compounds include p-cymene, γ-terpinene, caryophyllene, spathulenol, germacrene-D, β-fenchyl alcohol and δ-terpineol. Drying of the plant material affects both quantity and distribution of volatile compounds, with methods using higher heat and longer drying times having greater negative impact. A sample of fresh whole plant material found to contain 33 g/kg dry weight (3.1 g/kg wet) decreased to below a third after warm-air convection drying. Much higher concentrations of volatile compounds are achieved towards the end of the growing season. 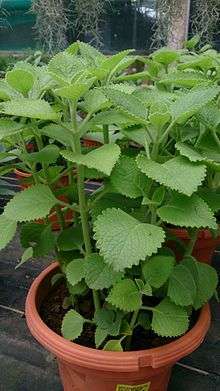 Cuban oregano or oregano poleo (Plectranthus amboinicus, formerly Coleus aromaticus), is also of the mint family (Lamiaceae). Sometimes also called "Mexican mint" or "Mexican thyme", it has large and somewhat succulent leaves. Not just a Latin American plant, it is also grown and used throughout the tropics, including Africa and Southeast Asia. Mexican oregano (Lippia graveolens) is not in the mint family, but in the closely related vervain family (Verbenaceae), that includes e.g. the lemon verbena (Aloysia citrodora). It is a highly studied herb that is said to be of some medical use and is common in curandera (female shamanic practices) in Mexico and the Southwestern United States. The flavor of Mexican oregano has a stronger savory component instead of the piney hint of rosemary flavor in oregano, and its citrus accent might be more aromatic than in oregano. It is becoming more commonly sold outside of Mexico, especially in the United States, where it is an important source of dried oregano. It is sometimes used as a substitute for epazote leaves; this substitution would not work the other way round. Epazote has a lighter, and even more savory flavor and citrus accent than Mexican oregano, and of course, a very strong sweet tarragon-like flavor which might be its strongest component. When Mexican oregano is substituted for epazote, the base flavor less the tarragon-like sweetness is provided, and other corrections to the recipe may cover for the missing tarragon component of epazote, or the dish may be served without that flavor component. If epazote were substituted for Mexican oregano, many dishes would be overpowered by the tarragon accent. Poliomintha longiflora is also occasionally called oregano in America. ↑ "American: Oregano". Collins Dictionary. n.d. Retrieved 25 September 2014. ↑ "British: Oregano". Collins Dictionary. n.d. Retrieved 25 September 2014. ↑ "Oregano". Online Etymology Dictionary, Douglas Harper, Inc. 2016. Retrieved 6 October 2016. ↑ "Origanum vulgare L. oregano". Plants Database, United States Department of Agriculture. Retrieved 30 January 2011. ↑ "Growing Culinary Herbs In Ontario". Ontario Ministry of Agriculture, Food & Rural Affairs. Retrieved 30 January 2011. ↑ Peter, K. V. (2004). "14.3.1 Growth habit of wild oregano populations". Handbook of herbs and spices. Volume 2. Abington Hall, Abington: Woodhead Publishing Limited. p. 219. ISBN 1-85573-721-3. Retrieved 30 January 2011. ↑ "Herbs". Government of Saskatchewan. September 2009. Retrieved 30 January 2011. ↑ "RHS Plant Selector - Origanum vulgare 'Aureum'". Retrieved 25 May 2013. ↑ Mockute, Danute; Bernotiene, Genovaite; Judzentiene, Asta (2001). "The essential oil of Origanum vulgare L. Ssp. Vulgare growing wild in Vilnius district (Lithuania)". Phytochemistry. 57 (1): 65–9. doi:10.1016/S0031-9422(00)00474-X. PMID 11336262. ↑ "Oregano". Plants for a Future. 2012. Retrieved 7 October 2016. 1 2 "Oregano". Drugs.com. 2016. Retrieved 7 October 2016. ↑ "Oregano". MedlinePlus, US National Library of Medicine. 2016. Retrieved 7 October 2016. ↑ Mitchell, LaTonya M. (22 September 2014). "Inspections, Compliance, Enforcement, and Criminal Investigations: Warning Letter to Young Living 9/22/14". US Food and Drug Administration. Retrieved 7 October 2016. ↑ Dragland, Steinar; Senoo, Haruki; Wake, Kenjiro; Holte, Kari; Blomhoff, Rune (2003). "Several culinary and medicinal herbs are important sources of dietary antioxidants". Journal of Nutrition. 133 (5): 1286–90. PMID 12730411. ↑ Tair, Asma; Weiss, Erika-Krisztina; Palade, Laurentiu Mihai; Loupassaki, Sofia; Makris, Dimitris P.; Ioannou, Efstathia; Roussis, Vassilios; Kefalas, Panagiotis (2014). "Origanum species native to the island of Crete: in vitro antioxidant characteristics and liquid chromatography–mass spectrometry identification of major polyphenolic components". Natural Product Research. 28 (16): 1284–7. doi:10.1080/14786419.2014.896011. PMID 24635145. ↑ Teixeira, Bárbara; Marques, António; Ramos, Cristina; Serrano, Carmo; Matos, Olívia; Neng, Nuno R; Nogueira, José M F; Saraiva, Jorge Alexandre; Nunes, Maria Leonor (2013). "Chemical composition and bioactivity of different oregano (Origanum vulgare) extracts and essential oil". Journal of the Science of Food and Agriculture. 93 (11): 2707–14. doi:10.1002/jsfa.6089. PMID 23553824. ↑ Figiel, Adam; Szumny, Antoni; Gutiérrez-Ortíz, Antonio; Carbonell-Barrachina, Ángel A. (2010). "Composition of oregano essential oil (Origanum vulgare) as affected by drying method". Journal of Food Engineering. 98 (2): 240–7. doi:10.1016/j.jfoodeng.2010.01.002.